Drain Doctor’s Tech (Larry Reed) locating a septic tank in order to dig it up and pump it. 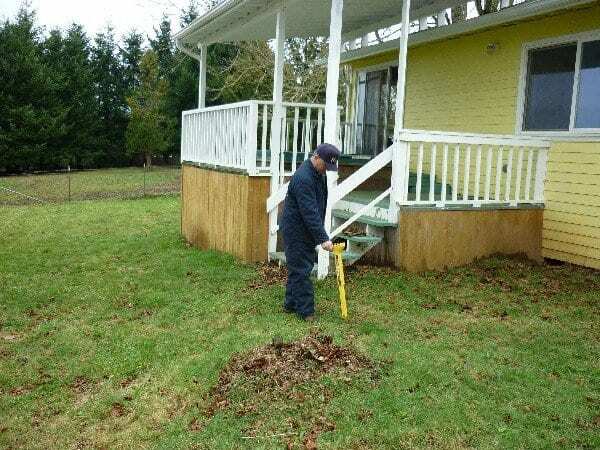 The locator gives off a series of beeps when it locates the septic tank telling Larry where to dig. Surprisingly, many homeowners have had to figure out how to locate a septic tank on their property. If you’re buying a property with a septic system or realize your property’s tank has never been maintained, you’ll want to know where the tank is because all septic tanks must be pumped eventually. In a real estate transaction, the property owners or real estate agent might know where the tank is. Ask for the “as-built,” which is a diagram of the septic system and its installation details. It should also be on file with your local health department, which may have an online system to research the property immediately. Unfortunately, finding the septic tank may not be that easy. Filing the as-built with the local health department wasn’t always mandatory. In Oregon, septic system permits have only been required since 1972, so you may need to rely on visible cues. In the basement or crawl space, look for the building’s four-inch sewer pipe and where it leaves the house. Find the spot outside where the pipe exits the building or an access cover over the pipe. Septic tanks must be at least five feet away from the building, but they’re typically 10-25 feet away. Using a metal probe, you can follow the pipe to the tank. Note that sewer lines may bend and go around the corner of a building rather than follow a straight line to the tank. Probe gently so you don’t damage the tank. Septic tanks are either one or two-compartment tanks, depending on age. Each compartment has a lid; two for dual-compartment tanks installed after. If the tank has an access port called a riser, the lid could be obvious. Look for circular, plastic discs a foot or two wide. However, since the lids can be flush with the ground or just a few inches above it, they can get overgrown with grass and other vegetation. You might also find a heavy concrete lid. Tanks without risers also have lids, but they’re underground. If a riser and lid are not obvious as you walk the property, look for signs of the drain field like an area of grass that grows faster or more slowly, grass that’s a different color than the rest of the yard or places where snow melts more quickly. High or low spots in the yard may also indicate a buried tank or drain field. Probing these areas will help you locate the tank. You may feel embarrassed about forgetting the location of your septic tank, but it is a common problem. A contractor can help you find it and may do so as part of pumping service. Give us a call at 503-630-7802 if you need help finding your tank or have other questions. We are here to help you!